We saw this excellent film on the weekend which highlights cyber-bullying amoungst other issues related to use of the internet. 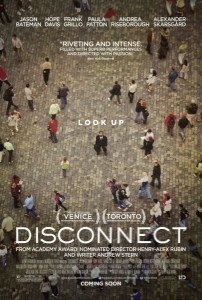 It has to be said it is a dark film as director Henry Alex Rubin explores the destructive potential of the internet. The cyber-bullying involves an introverted teenage goth, when he becomes the victim of a humiliating prank when two male tormentors pose as a girl, trick him into exposing his true identity online. The prank leads to tragedy. Three storylines cover smart-phone addicts, cyber-bullying and phishing and shows we can all learn a lot about the potential risks that exist on the internet. We read on filmthreat.com.. It’s not that the Internet is eroding society. The Internet merely magnifies the pre-existing emotional erosion of humanity. Identity theft is just another outlet for the age-old grift. Before cyber-bullying, there was regular bullying. As long as teenagers have existed, they have refused to tell their parents anything about their lives. Sad, but true. We urge everyone to see this film. 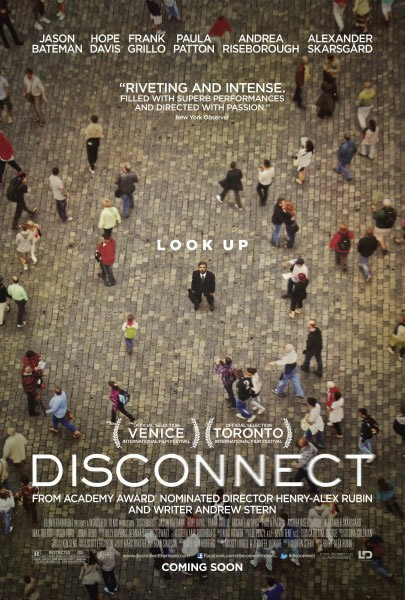 Disconnect is a 2012 American thriller film directed by Henry Alex Rubin and stars an ensemble cast, which includes Jason Bateman, Hope Davis, Frank Grillo, Andrea Riseborough, Paula Patton, Michael Nyqvist, Alexander Skarsgård, and Max Thieriot.